Tuesday night Alycia and I finally made it over to The Marshal in Hells Kitchen. She had been telling me about it for a while, and I obviously missed her, so I was so glad that we got together to check it out. She said they get really busy, understandably, so we made a reservation which they honored and sat us right away. Love that. The Marshal is located at 628 10th Ave in Hell’s Kitchen. It is a pretty small place so you could definitely walk right past it if you weren’t paying attention, like I almost did. Thankfully Alycia passes the place on her way home from work every day. 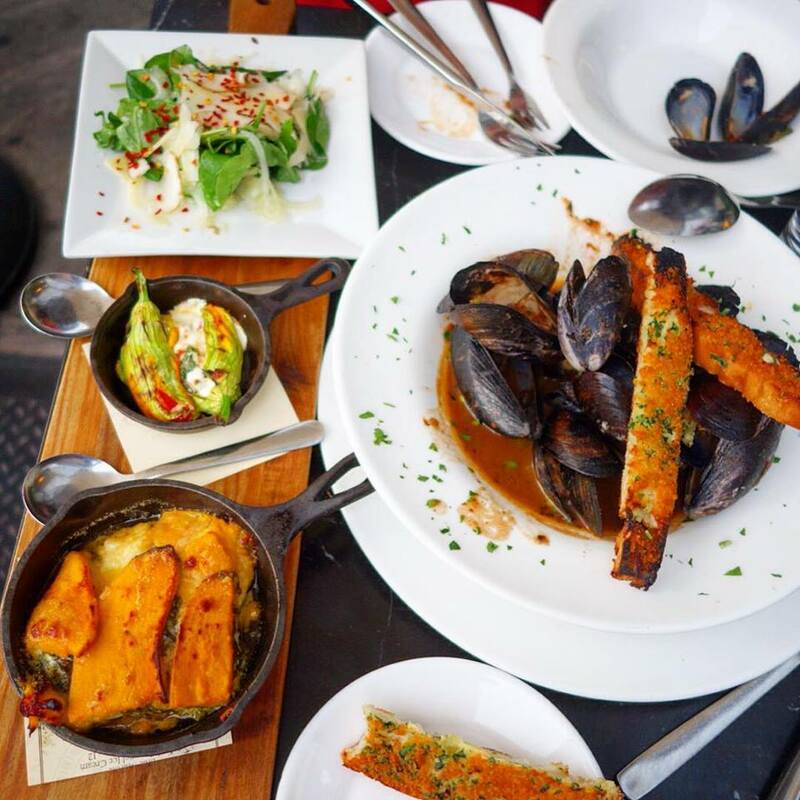 They are known for their delicious and thoughtfully crafted dishes that are locally sourced. I’ve never eaten at a farm to table restaurant before, at least not that was advertised as such, so this was a treat for me. I loved seeing where all of the ingredients came from. I have listed the specifics of each dish in the image descriptions. The service here is also wonderful. The waiters are very knowledgeable and if you need recommendations they are right there with them. Even the bus boy/plate delivery guy was awesome. He was so tentative and thoughtful with his placement of things on the table and letting us know what the dishes we were receiving were. It was a beautiful night so we decided to sit outside. Our table was on a slant and at one point Alycia fell over out of her chair because of it, but the food and service well made up for the uneasy seating! To start we had the Duck Liver Pâté. 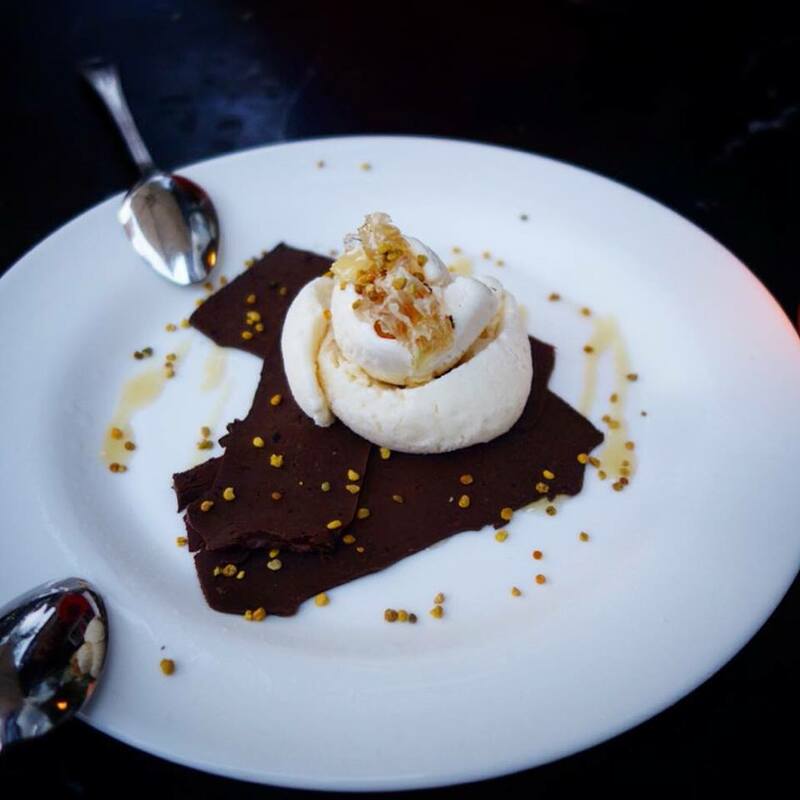 It was served with homemade crostini, topped with duck fat for extra decadence, and something new to me was the addition of the honeycomb. I am not normally a fan the savory and sweet things, but this worked for me. The crostini were so crunchy and flavorful. I just loved this dish. 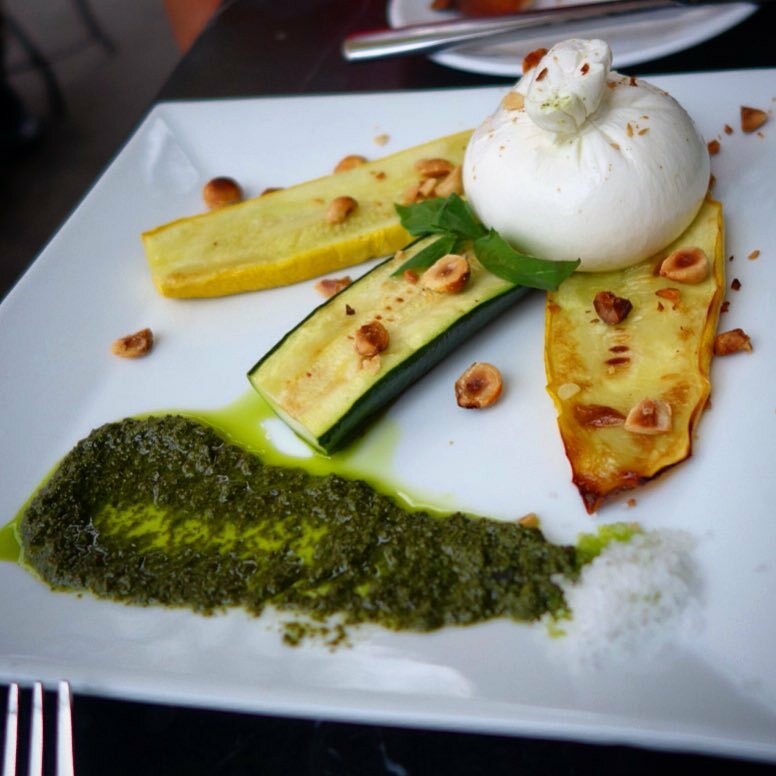 To make it even better we combined it with our 2nd dish, which was Burrata with basil pesto, hazelnuts, summer squash and sea salt. I would’ve never even thought to put burrata on top of my liver, but Alycia went right for it, so I did too, and it was amazing. The sea salt from the burrata plate really finished off the pâté for me. Growing up in a Jewish family I have always put sea salt on my chopped liver, so I just loved being able to grab from one dish and combine with another. I’m glad these two dishes came out together! The soft burrata spread right onto the liver and it was just perfection. 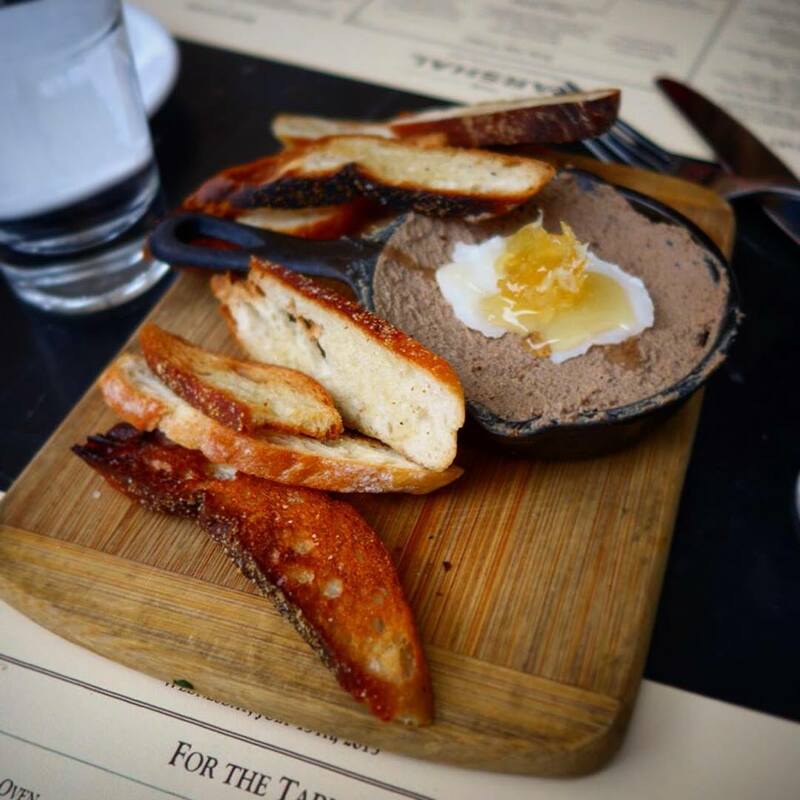 The Marshal – Duck Liver Pâté -Hudson Valley Duck Farm, duck fat, Andrew’s honeycomb, homemade crostini. Our main course and sides came out next. My favorite dish of the night is the one in the bottom left corner of the pic, the Sweet Potato and Kale Au Gratin. I would REALLY like to know how to make this. It was more amazing than I even thought it was going to be. Above that are stuffed zucchini blossoms, which were very good. I really liked how the cheese got all crispy in the mini cast iron skillet. I also just always get a kick out of mini cast iron skillets. Top left is the fennel and arugula salad, which Alycia loved. It was a little sweet for my taste, but it was topped with red pepper flakes that were very spicy, so that worked for me. Lastly, on the right hand side of the picture are the mussels. I loved the toast that it came with. Yum. The flavor of the broth was good, but we had an issue with the shells being cracked. We notified our waiter and Charlie Marshal, which I am guessing is the owner, came over and explained that they were cooked too close to the flame and that they will be aware of this for the future. I loved how they handled the issue. We were full by this point, so we preferred to not have an additional order of them, but instead they brought us a complimentary dessert, which just made my night. More about that after this pic. 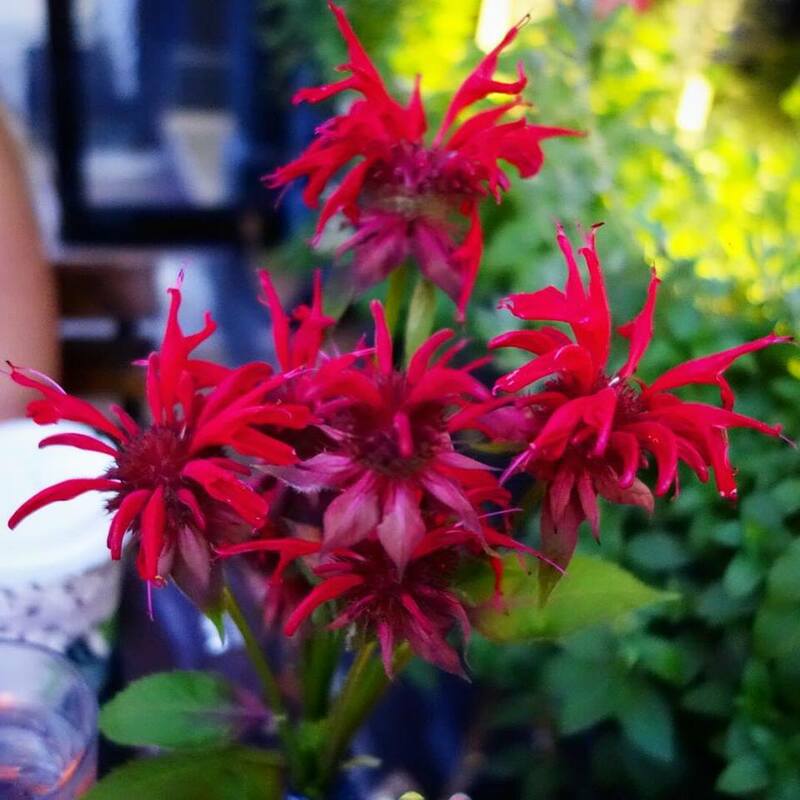 After we were done eating Charlie checked back in, and it was funny, he asked if we had eaten the flowers on our table yet… we looked at each other like, whaaaat?? So he explained further that they were Honey Balsam flowers and that the petals were edible, and urged us to try them. They were so sweet, like fruit! Amazing. When he asked us if we thought a sorbet made with them would be good, I hadn’t tried the part that went directly in the ovary of the flower. (I know, super nerdy, but I think that’s what it’s called lol) But once I discovered that tiny bit at the bottom of the petal I just couldn’t stop getting that little sweetness from the remainder of the petals. Poor flowers! We left with not a petal left on them. I definitely recommend checking out this place. We WILL be back to try many other things, such as their meatloaf, lamb shank and mac and cheese, for sure! I heard they do brunch, which I would love to check out, but I am really rarely ever in the city on the weekends. For more information visit their website at www.the-marshal.com, or call 212-582-6300.